someone to help you hold the tape – depending on the width of the gateway. When measuring up for farm gates we need to know how wide the gap is between your posts. We’ll work out exactly how wide to make the gate, allowing for the hinges & latch. If you’re yet to do your fencing and haven’t got posts or fencing in yet, then just let us know how far apart the posts are going to be put, and make sure that’s exactly how far apart they do go in, otherwise your gates won’t fit. This way you can get on with your fencing while we make your gates. If you don’t have posts or pillars already, don’t forget to allow for them when measuring and ordering. There’s more information on the fittings and posts page. Measure the distance between the top and bottom of your posts. It’s important to take both measurements because your posts may not be exactly straight. Measure the height of your posts§. Most gates are about 1.2m tall from the top bar to the bottom bar (not including scrolls or handles), and you’ve got to allow about 50-100mm under the gate. If your posts are shorter than 1.3m then we may need to adjust the height of your gate or move the top hinge down. We’ll discuss this with you once we have your measurements. What height do you want the gate? Measure the height§ of your posts/pillars and work out how much of a gap you’ll be leaving under the gate. We generally recommend about 50-100mm. Height required is for the actual height of the gate. let us know whether this height is to include any top scrolls or if these are to sit proud of the posts/pillars, e.g. in some cases the gates look best if the top line of the square gate frame sits level with the posts and the scroll topper is above. Other’s look best if the top scrolls line up with the posts. Diagram of each type of option. If the gate you have chosen is not straight across the top, e.g. bow top, asymmetrical, etc. let us know how tall you want it from the ground at both the tall and short points. § It is assumed that the top of your posts are level. It is also assumed that the ground is level enough for the gate to open fully. What you need to tell us when getting a quote for a garden arch. The type of side infill/pattern – trellis sides for plants with canes, e.g. roses, mesh sides for plants with tendrils, e.g. jasmine or wrought iron pattern if it’s to be more of a feature. If you want an asymmetrical arch, ie wide on one side and narrow on the other, we’ll need to know the depth of each side panel – call us so we can discuss this in more detail with you. Please give us as much detail as possible. 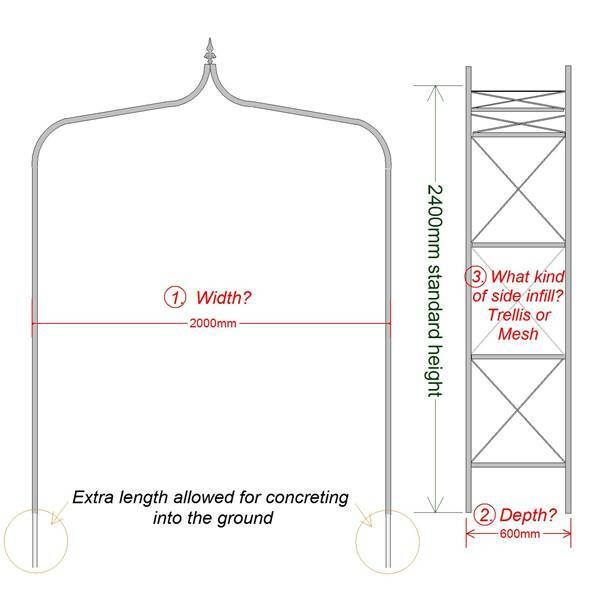 For example, if it’s for a wrought iron table or firescreen , then the height, width and depth is required at the very minimum for quoting purposes as well as a diagram or photos. If you need assistance please call our helpful staff on (08) 8568 5433 for advice.